wait until the update notification is sent to your device. 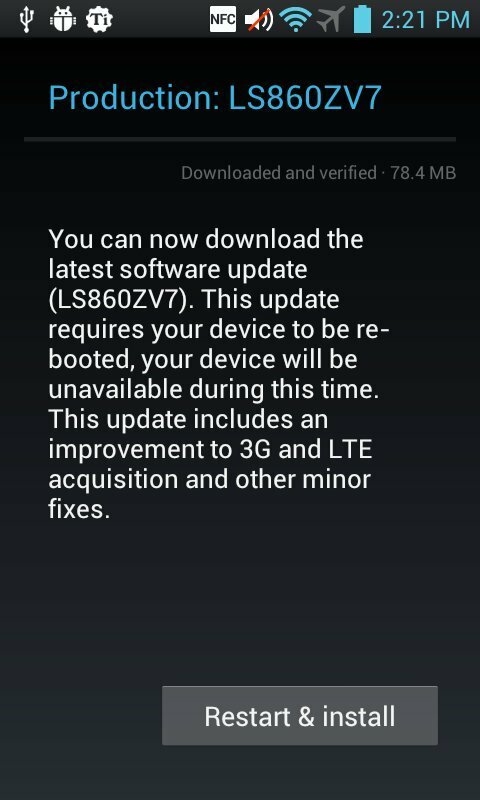 Pretty sure you mixed up the update version here, as the Mach is an LG LS860, not 970. LS970 is the Optimus G.
Is there already, or will there be a LS860ZV8? I'm going to assume the answer to Charles' question, above, is a no? It seems like the Mach was orphaned practically the moment it was released. I notice it doesn't even have a dedicated sub-board of its own in the Sprint Community LG area. Too bad, too, as I've found it to be an extremely capable phone. Compared to my previous model, the original Samsung S̶h̶*̶t̶s̶t̶o̶r̶m̶ Transform (what a disaster), the Mach is a speed demon! Especially for those of us who like having a physical keyboard. Add to that the fact that I got mine for $20 @ Amazon (with contract renewal) less than a month after it was released, and I've been extremely happy with it. I love this phone also best phone i have had from sprint the keyboard is the best i am abel to type very fast cause the keys are raised up a little.......I have had Sprint over 10 years best one yet!!!! Message was edited by: TheModerator - This is a public forum. To protect your privacy, please do not post any personal information including phone numbers, full address, email address, or account number and/or PIN.